The Boeing 747 is an iconic aircraft that singlehandedly pushed the airline industry into the jumbo jet age. 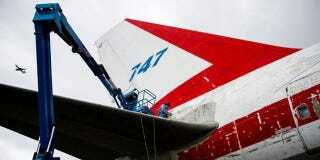 Sitting derelict at the Museum of Flight for 14 years, the very first of its kind is currently undergoing a rigorous restoration process to restore its former glory. As Seattle PI reports, the original 747-100 took its first flight in September of 1968. The intervening years have not been kind, to say the least. The Museum of Flight's curator, Dan Hagerdon, originally assessed the jet's damage over a decade ago, but it wasn't until recently the process finally was set in motion. Guy Amico, the president of Global Jet Painting, was brought on the restoration of project as well. Compared to other projects his crew has done, including Donald Trump's and John Travolta's planes, this Boeing 747 was much more worse for the wear. The crew will need to sand down the entirety of the exterior before they start to paint to mammoth craft. The project is on track to be completed by September, and will cover a full interior renovation as well as a full suite of repairs. Once the aircraft is completely restored the museum will allow patrons inside it to see just what it was like back in its hey-day. Photos by Jordan Stead/SeattlePI. See more images of the restoration along with more details about the process in the original article at SeattlePI.